- A photo page on Media Asia's "The Touch - Unlock The Legend" party is added at Gallery -> Event Photos. The photos are not new (from May 2001). As we know, Media Asia is no longer a collaborator of The Touch, also the Cannes party photo page at coolala.com is not available anymore. - Some movie clips from Police Story III: Supercop and Tai Chi Master. Thanks to BAM! - Ammy Awards official website published a letter from Michelle, who was awarded the Best Actress on Nov. 10th. - Video from The Touch press conference (in Mandarin and English, 1 min 33 sec. ETtoday). You can actually see parts of two trailers! - Just realized the Guestbook signing feature hadn't been working for the past two months due to the host change of dreambook.com. They have fixed the problem under my request and now everything is working again. - A couple of more photos from the Beijing press conference are added for The Touch (Dec. 5 news). 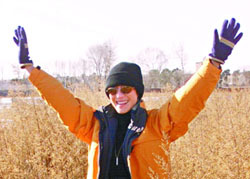 photo from HK Daily: Michelle at Beijing suburb (click to enlarge). - More updates and photos for yesterday's The Touch news. - Vote for your favourite teenage Michelle! 16 finalists have been selected by Yahoo! and Mythical Films from Singapore, Hong Kong and China. Go here to watch the videos and cast your vote. If you're serious with the voting, I'd suggest you NOT to skip videos as sometimes videos and photos give different impression. The polling promotion will be expired on December 12. - More updates for The Touch: some photos from Beijing suburb, and more. photo from Sina: Michelle at the press conference. - The Touch press conference was held in Beijing at the afternoon, Dec. 5. See The Touch news. During the press Michelle mentioned that she's still considering the offer to guest star in Bond 20, as it may conflict with her next project, Hua Mulan, which starts early next year as well. * Michelle and Thomas Chung have bought out Media Asia's share of Mythical films, including Media Asia's investment in The Touch. The new multi-media company is called Han Productions. Mythical Films will now become the mainstay of Han. * The Touch shooting has moved into studios in Beijing and the production is expected to wrap on Jan 15 as scheduled. * A new film Hua Mulan is currently in advanced development and is written by Wang Hui-Ling, co-screenwriter on Crouching Tiger Hidden Dragon. It is the story of the life of the legendary female warrior who inspired Disney's animated picture Mulan. The budget is likely to be in excess of $25m and location scouting begin in earnest after completion of The Touch. "...Along the way, the heroine gradually and understandably yet breathtakingly evolves from a cutesy pie dressed in white and light blue to a vengeful warrior whose clothing is as black as her mood..."
There is a new clip from Crouching Tiger, Hidden Dragon as well. The new 007 movie, to be directed by Lee Tamahori, is primed to start filming at Pinewood on January 14. Scripted by Neil Purvis and Robert Wade (who wrote The World Is Not Enough), the latest Bond adventure will also feature John Cleese, Judi Dench and Michelle Yeoh, who appeared in Tomorrow Never Dies. For more details on the competition see earlier news on Oct. 22. - Michelle in Bond 20? Female lead will be played by American actress Halle Berry of X-Men and Swordfish fame, and Michelle Yeoh, who appeared as the first Asian Bond girl in 1997's Tomorrow Never Dies, is scheduled to appear as well. Severeal Chinese news also reported that Debbie McWilliams, the casting director of Bond 20, was in Hong Kong after visiting Korea. It is believed her stay in Hong Kong is connected to Michelle's appearance in the next 007 film. It's not clear how big the role Michelle's part is. - Thanks to Steve for sending in this news from Ananova - Michelle to co-star Bruce Willis! Natasha Richardson is set to join Bruce Willis and Robert Duvall in the Far Eastern thriller The Last Place On Earth. Michelle Yeoh is also due to star in the film, which is set in Cambodia. Richardson will play Willis's wife. The story focuses on a CIA operative, played by Willis, who becomes a fugitive after being falsely accused of treason. He is traced to Cambodia by a reporter played by Yeoh. Duvall plays Willis's duplicitous ex-boss. The film is due to be made next spring by the Cobalt Media group, with American and British backing. - Since my old scanner doesn't work with the new computer I got, I had to hand-type in this article, Tiger Charm from October's The Malysian Women's Weekly. It's the only interview for magazine Michelle had so far since she produced The Touch. Thanks to Mai Loon for the magazine and the photo scans. The pictures are beautiful. Holy Weapon (Nov.15), Crouching Tiger, Hidden Dragon (Nov.22), The Heroic Trio (Nov.29), Supercop (Dec.6), Butterfly and Sword (Dec.13), Wing Chun (Dec.20). - Detailed review of Crouching Tiger figures. Also, I heard that an ad about Malaysia represented by Michelle has been broadcasting in China, at least at Beijing and Shanghai TV stations. The ad ends by Michelle saying: "This is Malaysia, the charm of Asia." - New movie trailers: Yes, Madam, Royal Warriors, Easy Money and Tai Chi Master. Thanks to BAM! - AMC's CINEMA SECRETS, will start premiering on Friday, November 2 at 10:00 PM (ET). Cinema Secrets. "Wired". 30 minutes. A look at fight scenes in films utilizing wire-work effects, including Crouching Tiger, Hidden Dragon. ...actors Michelle Yeoh and Zhang Ziyi, and fight master Yuen Wo-Ping, discuss how cast and crew used innovative wire work to push the limits of filmmaking in the Oscar(R)-winning CROUCHING TIGER, HIDDEN DRAGON (2000). For the gravity-defying bamboo battle scene, a complex maze of cables and cranes was constructed in the rugged Chinese jungle to rig the actors for what appeared to be a magical tree top ballet. The episode explores how director Ang Lee paid homage to the original master of Chinese sword-fighting films, King Hu, with a look at his wire work in TOUCH OF ZEN (1969). Friday, Nov. 2, 7:00 PM, 11:30 PM. Saturday, Nov.3, 7:00 AM. AMC. Check your local TV schedule for show times in your area. - Another photo from Tibet for The Touch. Praying ceremony on Sept. 14. - The Touch news highlights: Thomas Chung talks about the production. More details and some photos from the Tibet shooting. See The Touch news. - The Touch news updated. - Michelle, alongside Zhang Ziyi and Lucy Liu, are nominated as best actress at the 2nd Annual Ammy Awards (2001). The best actor nominees include Chow Yun-Fat and Jet Li. The Ammys are the only award ceremony that honors the complete range of Asian and Asian American cinematic and broadcast achievement-the only one that celebrates the full spectrum of foreign, independent, Hollywood, and television. They're also the only awards that are voted on by the most important people in the media process: the audience. The top nominees were selected by almost 7,000 aMagazine readers who cast their votes via mail-in surveys and online at the official Ammy Awards web site. A panel of industry insiders actively involved in the Asian American entertainment community will determine the Award winners. The Awards ceremony (open to public) will be at Saturday, November 10th, Orpheum Theatre, Los Angeles. Brooklyn Academy of Music is running a twelve-film series, "Dance of the Dragon: Martial Arts on Film," at BAM Rose Cinemas every Saturday and Sunday from Nov. 10 to Dec. 16. Wing Chun will be shown on Saturday, Dec. 15 at 2:00pm, 4:30pm, 6:50pm, and 9:10pm, at BAM Rose Cinemas, 30 Lafayette Avenue, Brooklyn, NY, (718) 623-2770. For more information on the schedule and tickets, see BAMcinematek. - Updates on Mythical Films' the Original Scripts and Short Films Competition: The committee has received more than 2000 applications. 460 film scripts and 76 short films are in the competition. The finalists of the short films are available online between Oct. 22 and Nov.4 for internet viewing and voting. The public voting result count 20% while the scores from the committee count 80%. If you'd like to participate in voting, go to this site. Each film is listed in both Chinese and English and with English subtitles. For those who don't read Chinese, here is an instruction : to view the films, click the blue characters on the yellow line below the film titles. To vote, click green characters. The three fields on the voting window are: name, e-mail, and phone number. Click the button on the bottom to submit your vote. The link on the lower right corner is to show the current voting result. Each person (via e-mail address) should only vote once. Voters have chance to win some gifts too. - Miramax has bought the remake rights to a current big hit South Korean film, My Wife Is a Gangster. The project will go out to writers and directors soon, and the production is expected to begin in the next 18 months. Central News Agency (Taiwan) reported from Seoul that Miramax is considering inviting either Michelle or Cameron Diaz (Charlie's Angels) for the lead. My Wife Is a Gangster is an action comedy about a female mob boss who gets married to please a dying sister. The gangster sends her henchmen to find a suitable guy and they come back with a poor, unsuspecting dupe who has no idea what he's getting into. The budget of the remake will be about $70 million. ... ... With "Iron Monkey" high-kicking its way into theaters, could the chopsocky craze be catching on among book publishers? Earlier this year, Simon & Schuster paid six figures for English-language rights to the Crane-Iron Pentalogy, a series of 1930s Chinese epics by Wang Dulu that were optioned by Ang Lee as the basis for "Crouching Tiger, Hidden Dragon," which was based on book four of the series. For more information on Wang Dulu's Crane-Iron Pentalogy, see CTHD Novels page. - New images for Supercop: movie stills and some behind scenes photos. AFI FEST 2001 (November 1 - 11) will pay special tribute to Academy Award and Golden Globe Award-winning director Ang Lee on Friday, November 9, at the historic Egyptian Theatre on Hollywood Boulevard. The evening will feature a montage of the acclaimed director's films, a moderated selection of film clips and an on-stage conversation with Lee. The Ang Lee Tribute is presented by the Skirball Cultural Center as part of a new Skirball Cultural Center-AFI alliance. The Skirball Cultural Center will also be the screening venue for a related Ang Lee retrospective on November 5, 6, 7 and 9 as part of the AFI FEST 2001 Program. Six of the director's films will be presented: Crouching Tiger, Hidden Dragon; The Ice Storm; Sense and Sensibility; Eat Drink Man Woman; The Wedding Banquet and Pushing Hands. - Movie synopsis has been added for The Touch. - If you haven't seen it, here you can download the Mountain Dew video commercial named "Duo" (Mountain Dew - Crouching Dew). 1.8Mk. (thanks to Kim). Any reminiscence? And here is an article on its making with some still pictures. - New additions in Gallery -> Event Photos: more photos in "Michelle and Her Wax Double" and an external link in "Michelle In L.A." (at the bottom of the page). - The Touch news: comedian and actor Dane Cook will star in the film. - New movie trailers and clips are added at Movies -> Trailers & Clips. Thanks to BAM! - Brightened some images in Tomorrow Never Dies. - Some Cartoons/Caricatures are added in Gallery -> Art Work. - Here is a cool movie script, Chinese Roulette, written by fans of Hong Kong movies. It definitely makes a fun reading for anyone who's a fan of Hong Kong action cinema. Wow. Too bad I'm not in San Francisco. Anyone there? Academy Award winner Tan Dun's unconventional musical works bridge the worlds of East and West. Tan Dun conducts the world premiere of his Crouching Tiger, Hidden Dragon Suite for Erhu and Orchestra accompanied by images from the Academy Award-winning film. Crouching Tiger, Hidden Dragon Suite for Erhu and Orchestra is a concerto that was written for the film, but was never included in the motion picture as originally written. Karen Han is the featured soloist on the erhu, an ancient Chinese 2-string, bowed instrument, in the world premiere performances of the film score as originally composed by Tan Dun. Images from the film will be projected on a screen simultaneously during the orchestra's performance of the concerto. - Crouching Tiger, Hidden Dragon section: all images have been adjusted to brighter colors. - Michelle headed to Tibet on Tuesday. For more details see The Touch page. - A CNN article on Peter Pau (July 2001): The Man with the Golden Touch. - Michelle is among the Glamour Girls of People magazine's annual Best & Worst Dressed Celebrities issue (special double issue, September 17). There is a picture of Michelle in her tiger-striped crystal Oscars outfit. - Who will be the teenage Michelle? Voting for the finalists has started in Singapore part. Go to their official site. You can watch the videos and cast your vote. (The videos seem only working with Internet Explorer but not Netscape.) Voting in Hong Kong and China parts has not started yet. - Tai Chi Master updates: the section has been re-built. Movie comment and all images are new. - Some of you may have seen it - I have added a new pic of Michelle and Jackie Chan from their 1984 commercial in Biography. (The video clip will come soon - thanks to BAM!) Also new pics from Crouching Tiger and Wing Chun in the Main page animation. - Latest news for The Touch: The leading actor has been fixed and the shooting will start in September. 'Touch'-ing role: Chaplin runs off with Yeoh circus. - Miramax Films has purchased the North American distribution rights to The Touch. - Streaming feature is available for RealVideo clips in Michelle Yeoh Video Download. - Missed some of Michelle's public appearances on TV? Now you can get the video clips in Download section, from the Oscar ceremony back to 1997's Bond publicity - including the (in)famous Howard Stern Show. Millions of thanks to Angela! - "If you think you've got the beauty and spunkiness of international star Michelle Yeoh..."
- New clips in Trailers & Clips. Crouching Tiger, Hidden Dragon star Michelle Yeoh Choo-kheng, who also appeared in the James Bond movie Tomorrow Never Dies, is on a mission to find a young actress to play her 14-year-old childhood character in her latest film The Touch. The actress was in Causeway Bay yesterday to promote an on-line campaign to recruit the right girl for the role. The film tells the story of an acrobat, Yeoh, who pursues treasures in Qingdao, northern China, that have been protected by her ancestors for more than 700 years. The romance, action and adventure epic will cost up to $150 million to produce. Girls, aged between 12 to 18, who speak fluent English are urged to apply online at http://touch.yahoo.com.hk. Applicants should send personal information, photos and details of their homepage. Finalists from Hong Kong, China and Singapore will be placed on a shortlist. Production will begin this summer and the film is expected to go on global release next year. - Updated the page Rental/Buying Guide for Michelle Yeoh Movies. More information is added, including a comparison between subtitled and English dubbed versions. The page can also be accessed from Movie Index or Q&A. - Video: Michelle talks about the young Yan Fei role in The Touch. 56K or 100K. 4 min 57 sec. in Cantonese. - Hong Kong news: Mythical Films and Yahoo! Hong Kong are organizing a campaign called "Duplicate Michelle Yeoh, Search for juvenile Yan Fei" (Yan Fei is the name of Michelle's character in the upcoming The Touch). They are looking for a girl between age 12 and 18 to play the 14 year old young Yan Fei. A picture of Michelle when she was 14 is displayed. Details of the applications and regulations can be found at the Official Site (in Chinese). For people who don't read Chinese, here you can see some pictures of Michelle at age 7, 10, and 14. Candidates must speak fluent English. The winner will be announced before October 15 and will be invited to a press conference in Beijing in October. - Michelle had a private birthday party with her friends in Hong Kong at the night of 6th. - Crouching Tiger, Hidden Dragon: an English script is available. Enjoy! M i c h e l l e ! - a collection of news photos is added in Gallery -> Events. I think it is a perfect time to review some of Michelle's glory and/or fun moments! - The Touch page updated. - Music links are added to The Soong Sisters, Ah Kam and Tai Chi Master. - I've got an UNCUT DVD version of Butterfly & Sword (a.k.a. Comet, Butterfly, and Sword) from HK Flicks. All images on Butterfly & Sword section are re-scanned, with some additional pictures including the original ending. - No new words on the lead role of The Touch yet. Taiwanese news sources today have more information on supporting roles of the film. - CCTV (China) reports that The Touch team will be off to Lhasa (Tibet) on Aug 11 and the shooting will start on Aug 17. For more details please see The Touch page. - HK Coolala reports that there will be a role of Michelle's character in her juvenile years in The Touch. A global search for the right girl will be conducted in August, possibly through internet. - Crouching Tiger figures: Coming October/November 2001. These figures will be sold with and without theme bases and stand at 7" tall. - The Touch latest news: the male lead of the film is still in search but will be fixed within next two weeks. The shooting is expected to start in August. For more details please see The Touch page. How do you see The Touch in the context of your own career? Is it a make-or-break project? Chung: I would never go into anything make-or-break. The Touch is dollar-wise the highest commitment we [have made]. And it will be the lowest risk because we have the necessary elements to make a movie and sell it: the story, Michelle Yeoh as female lead and Peter Pau as director. Is it true that you're considering a live-action version of the Disney animated movie Mulan to be Michelle Yeoh's next project? Will she be the star? - Note: There will be no update on this site until July 22. I'm going for a trip. See you later! - Updated the pages of The Touch and Easy Money. - Crouching Tiger is listed no. 1 on the weekly charts for the nation's most popular videos as they appear in the July 7, 2001, issue of Billboard. - New background pic at the Movies page, and a new title pic for CTHD page. The video clip is in Mandarin. 54 seconds. Also the "Novels" page has been separated from "Production Facts" due to our visitors' suggestions. Thanks for your visiting and support! - "Production Facts" section has been added at CTHD page. It has some information and pictures on the shooting locations of the film. Also I have written summaries for those Wang Du Lu's novels, which the CTHD film is based on and I happily got a chance to read. Movie images will come before too long - yeah, I have been working on them. Thank you for your patience! - Michelle arrived in Taiwan yesterday for celebrating the launch of Pandasia Entertainment, a company which is one of the main investors of the upcoming The Touch. Other guests include Thomas Chung, Sylvia Chang, etc. from Hong Kong. Michelle confirmed the shooting of The Touch will start in July. After Cannes, she went to Himalayas and other parts of China for the second time of location checking, and she has been doing physical training for the film. - First-week consumer sales of the DVD version of Crouching Tiger, released June 5, were the highest ever for Columbia TriStar Home Entertainment, generating about $30 million in retail value on sales of an estimated 1.5 million units. It is the biggest first week of the year for a DVD title and the second biggest first week of any DVD title. Rental-priced videocassette sales of Crouching Tiger have also been strong, with consumers spending $7.75 million to rent some 450,000 copies at retail stores 2.2 million times, according to VSDA VidTrac. In addition to the videocassette rentals, consumers spent another $3.68 million renting the DVD version of Crouching Tiger. The current box office gross of the film is $127 million in U.S., $208 million worldwide (the cost of making is $15 million). Still being shown in 229 theaters after its 27 week release in U.S., Crouching Tiger was ranked no.19 at last weekend's box office. - Crouching Tiger, Hidden Dragon is now available on VHS and DVD. - Video Interview with Michelle, (by Crystal Kwok, Coolala), in Cantonese. The video includes on and off screen scenes from Crouching Tiger, also short clips from Yes, Madam, Owl vs Dumbo, and Magnificent Warriors. - a new Michelle site, 99% Photos, done by Michelle's old friend, photographer Roy Tan. There you can see some exclusive photos of Michelle taken by Roy himself during 1988 -1995. The Touch party at Cannes (May 11, 2001): no... no drinking game ;-). 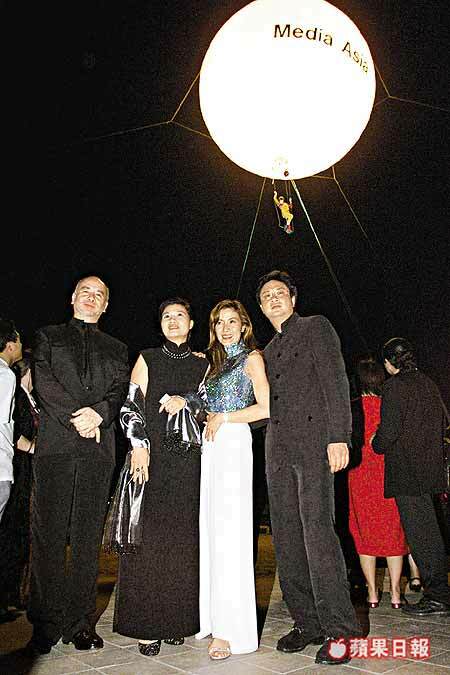 It shows an acrobatic performance on Media Asia's giant balloon, and the speech of Michelle and Peter Pau, in English, 2min 38 sec. The Touch press conference in Hong Kong (March, 2001): Michelle, Thomas Chung, and Peter Pau, in Cantonese. Oscar night (March 25, 2001): interviews with Michelle and Peter Pau right after the ceremony, in Cantonese. - Video: Michelle at Mythical Films Press Conference in Taiwan (May 2, 2001), in Mandarin and English, 2 min 40 sec. - Crouching Tiger, Hidden Dragon will come to Videocassette and DVD in U.S. on June 5! - Crouching Tiger, Hidden Dragon box office: total U.S. gross $125.5 million by last weekend; worldwide $204.6 million by May 3rd. - Michelle left Cannes at the morning of 12th. She and Peter Pau didn't attend 'Hong Kong Night' in the evening of that day. They will soon be in China again for the second time of the location check. Two male western leads for The Touch will be fixed in the next eight weeks and the shooting will start in July. - Michelle and Thomas Chung at the premiere of Moulin Rouge which opened the 54th Cannes Film Festival. - Michelle is in Cannes for the 54th Cannes Film Festival (May 9 - 20). She will be there until 12th to promote the upcoming film The Touch and other new Media Asia films. - Publicity video for Mythical Films's Original Scripts and Short Films Competition. Ang Lee, Fruit Chan, Mabel Cheung, Peter Pau, To Kwok Wai, Michelle, etc. talking about filmmaking. In Cantonese and Mandarin with English subtitles. 4 minutes. - On Sunday evening's Hong Kong Film Awards, Crouching Tiger, Hidden Dragon swept 8 awards including Best Picture and Best Director (see CTHD page for the list). In the Mood for Love grabbed 5, including Best Actress (Maggie Cheung, 5 time Hong Kong Film Award winner, also 5 time co-star of Michelle) and Best Actor (Tony Leung Chiu Wai, 3 time Hong Kong Film Award winner, Michelle's co-star in Butterfly & Sword). Question: when will the Hong Kong Film Academy recognize Michelle's rare genuine talent and quality? Sigh. They even didn't nominate her for Wing Chun and Supercop (while Jackie Chan got nominated as best actor for it)! more photos on Datuk Yeoh's title ceremony can be seen at Photos. - Note: there will be no update on this site until April 24. I'm going for a trip tomorrow. - Crouching Tiger, Hidden Dragon theme song video, made by Angela, the president of MYOFC. Q: I've read a lot lately about how you can download movies from the Internet. Is there a Napster-like Web site for this? - Time again for the Cannes film festival! Still remember Crouching Tiger, Hidden Drangon's world premiere at Cannes last year? Remember that Froggy's report from Cannes on Ain't It Cool news (May 18th, 2000)? - updated The Touch page. Michelle, Peter Pau, Thomas Chung (director of Media Asia), Julien Carbon and Laurent Courtiaud (script writers), with a team of thirty people headed to China on Monday. They're going to spend 3 weeks in China to check out the filming locations, which include Chengdu, Shanghai, and the Silk Road. The actual filming is planned to start in July and will last about 5 months. After working with "Crouching Tiger, Hidden Dragon"--it was the first time working with Michelle Yeoh, and she asked me to direct her next feature, called "The Touch." I was thrilled by her ideas about the film, and I completely revised the story. We are ready to go for pre-production now, and ready to shoot in July, in China again. We are able to go to more distant locations, like Tibet, Dun Huang, Shanghai, and Beijing. It's a contemporary story, a romantic action adventure film. It should make it to theaters in summer of 2002. - CONGRATULATIONS to Crouching Tiger, Hidden Dragon - 4 Oscar winners! Academy Awards will be presented on Sunday March 25, at the Los Angeles Shrine Auditorium. It will be televised live by the ABC Network beginning at 5 p.m. (PST), with a half-hour arrivals segment preceding the presentation ceremony. Michelle has already arrived in L.A. and will join Ang Lee, Chow Yun-Fat, Zhang Ziyi, Chang Chen, Cheng Pei Pei, and other CTHD crew for Sunday's ceremony. "Getting this kind of nominations, to have come this far, I really honestly believe we are winners already." - You're right, Michelle. So let's celebrate, no matter who will get hold of those small naked golden guys! 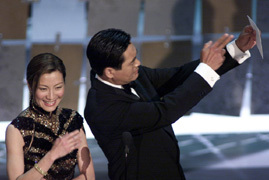 ** Michelle and Chow Yun-Fat, the couple with the best chemistry on screen, present an award together. ** three-minute long CTHD main theme performance. With Coco Lee singing "A Love Before Time", four dancers will perform martial art dance - a combination of moves from Peking opera, martial arts, and dance. - Anti-Awards: It is organized by a national consortium of 50 movie Web sites, authors, journalists and film industry people who are tired of the Academy of Motion Picture Arts and Science's sometimes obvious Oscar politics. They've created an annual film survey in which Web surfers (that means you) can choose their own movie winners. About 300,000 cast votes in last year's contest, which American Beauty won. - yes! Crouching Tiger, Hidden Dragon hit the $100 million mark at its 102th day release in U.S.
- Oscar night is less than two weeks away. Michelle will be an Oscar presenter this year! "Crouching Tiger, Hidden Dragon" star Michelle Yeoh will make her first appearance as an Oscar presenter during this year's telecast. The 73rd annual Academy Awards will be held March 25 at L.A.'s Shrine Auditorium. - Michelle has set up a Mythical Films Development Fund for emerging filmmakers in Hong Kong, Taiwan and China. A competition on screenplays and 60 min short films will be held in April. It's partially sponsored by Media Asia. The top winner will be hired as a director at Media Asia, and the top screenplay will be made into real movie. Winning applicants will be judged by a jury that will include Ang Lee, Sylvia Chang, Fruit Chan, Mabel Cheung, and Peter Pau, etc. - winner of 53rd annual Directors Guild of America Awards: best director - Ang Lee of Crouching Tiger, Hidden Dragon! 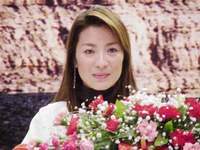 "Michelle Yeoh for the role of Shu Lien in Crouching Tiger, Hidden Dragon - As the owner of a security company in the stunning Ang Lee masterpiece, Yeoh paints a portrait of a woman of great dignity, intelligence, strength and beauty. With a look, Yeoh conveys all the years of hidden love and yearning Shu Lien feels for Li Mu Bai, with a gentle word, and a knowing expresssion, she reveals the depth of plans, and her incomparable battle scenes will take your breath away, and make your heart pound"
- Crouching Tiger, Hidden Dragon has received 10 Oscar Nominations, including best picture and best foreign language film! Congratulations to the CTHD filmmakers and crew, and all us fans! While we applaud the Academy giving a best picture nomination to an Asian language film the first time in its 73 year history, it's also pity none of the great performances from CTHD got rewarded as they deserve. But... does Michelle really need a recognition from Hollywood? To us, Michelle is always the winner. Even Oscar doesn't remember her, we will. - CTHD is nominated for the 53rd annual Writers Guild Awards. the awards will take place at March 4. Michelle Yeoh certainly deserves a nomination for her heartfelt turn as a lovelorn female mercenary in "Crouching Tiger, Hidden Dragon", but it would be a brave departure for the Academy to nominate a performance in Chinese. - 2001 Golden Globe Awards: Crouching Tiger, Hidden Dragon won the Best Foreign Language Film and Ang Lee won the Best Director for it! - Michelle and Chow Yun-fat are on the cover of the new issue of Entertainment Weekly (see MYOFC message board): "The Oscar Race Begins"
Happy New Year - 2001 !! !